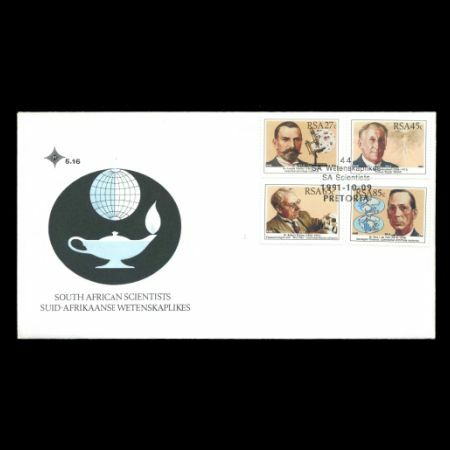 South Africa 1991 "South African Scientists"
On 19th October 1991 Post Authority issued in Pretoria a set of stamps depicted four greatest scientist of the country. 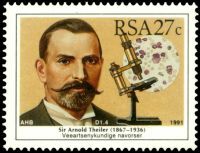 Arnold Theiler was born in Switzerland and came to South Africa in 1891. He settled as a veterinarian in the Transvaal, where he was confronted.by a host of unknown stock diseases. 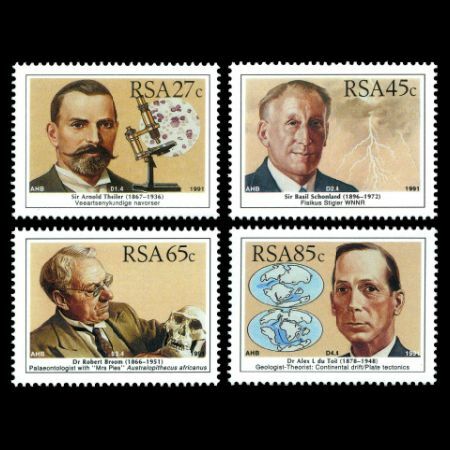 His research into the rinderpest epidemic of 1896 led to his appointment as state veterinarian to the ZAR by President Kruger. His small laboratory at Daspoort on the outskirts of Pretoria was the forerunner of the world-famous Onderstepoort Veterinary Research Institute of which he was the first director. His research on the causes and control of stock diseases brought him international recognition. 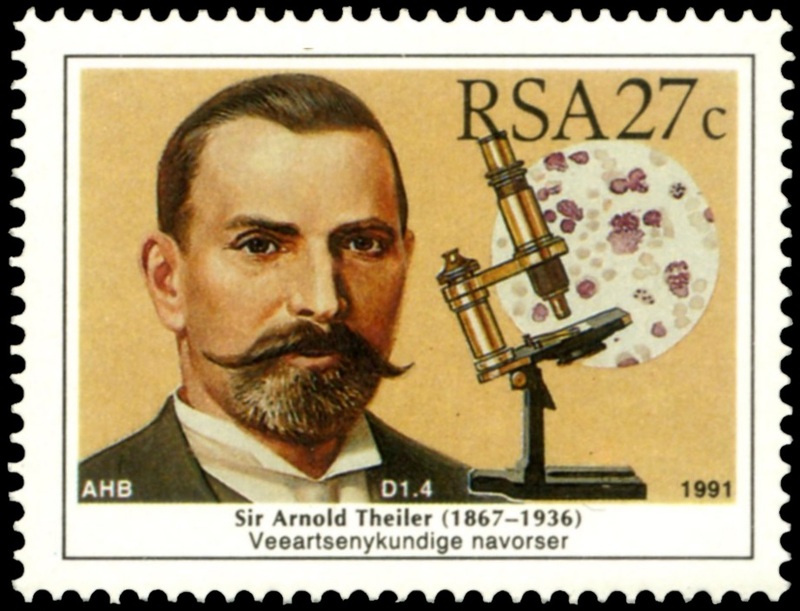 The blood parasite responsible for East Coast fever, Theileria parva, was named after him. His findings on deficiency diseases stimulated a worldwide study of deficiency diseases and nutritional disturbances. In 1914 he was knighted and received seven honorary doctorates and numerous awards. He died in London in 1936 on the eve of the second international microbiological congress in which he were to have taken part. Basil Frederick Jamieson Schonland was born in Grahamstown. He studied at Rhodes University College and graduated in physical sciences at Cambridge. In 1915 he enlisted in the Royal Engineers Corps and became an authority on wireless telegraphy. In 1922 he became senior lecturer in physics (later professor) at the University of Cape Town. His research concentrated on cathode and cosmic rays and atmospheric electricity, particularly lightning. Towards 1933 he was able to show, with the help of a Boys rotating lens camera, that a lightning flash consisted of a leader discharge stroke descending from the cloud and much stronger main strokes returning to the cloud. 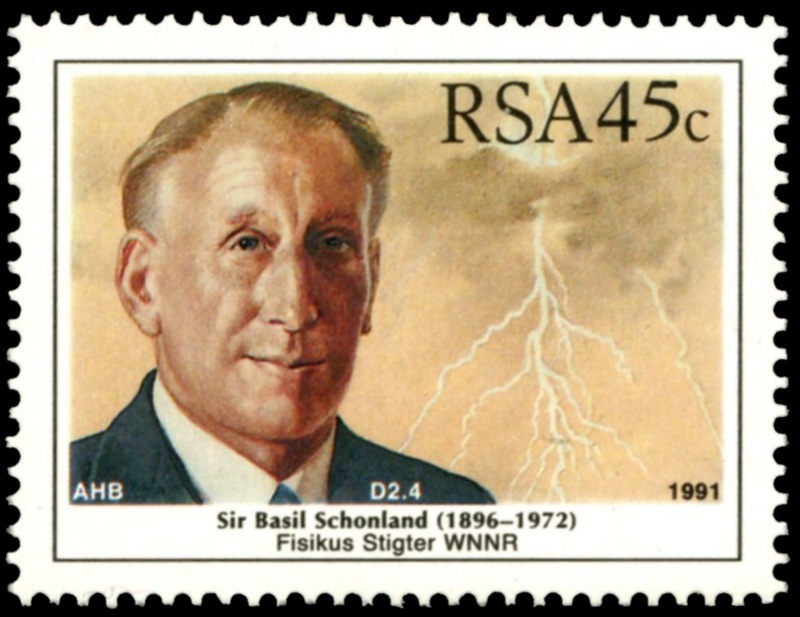 He was the first scientist to link radio atmospherics with lightning. 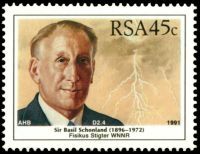 In 1937 he became director of the Bernard Price Institute for Geophysical Research and during World War ll he developed radar for the SA Defence Force. He was appointed superintendent of the British Army Operational Research Group and became scientific adviser to Field Marshal Montgomery with the rank of brigadier. 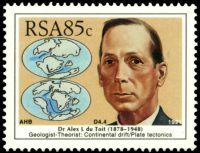 On his return to South Africa he became the first president of the newly established Council for Scientific and Industrial Research. In 1954 he was appointed deputy director of the Atomic Energy Research Establishment at Hawvell, England and in 1958 he became director. He was a Fellow of the Royal Society and received numerous honorary degrees and awards. He was knighted in 1960. 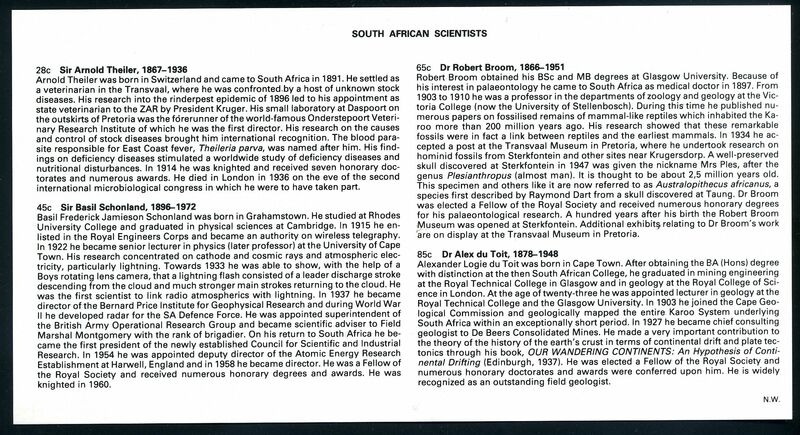 Robert Broom obtained his BS0 and MB degrees at Glasgow University. Because of his interest in palaeontology he came to South Africa as medical doctor in 1897. From 1903 to 1910 he was a professor in the departments of zoology and geology at the Victoria College (now the University of Stellenbosch). During this time he published numerous papers on fossilised remains of mammal-like reptiles which inhabited the Karoo more than 200 million years ago. His research showed that these remarkable fossils were in fact a link between reptiles and the earliest mammals. In 1934 he accepted a post at the Transvaal Museum in Pretoria, where he undertook research on hominid fossils from Sterkfontein and other sites near Krugersdorp. Awell-preserved skull discovered at Sterkfontein in 1947 was given the nickname Mrs Ples, after the genus Plesianthropus (almost manl. It is thought to be about 2,5 million years old. This specimen and others like it are now referred to as Australopithecus africanus, a species first described by Raymond Dart from a skull discovered at Taung. Dr Broom was elected a Fellow of the Royal Society and received numerous honorary degrees for his palaeontological research. 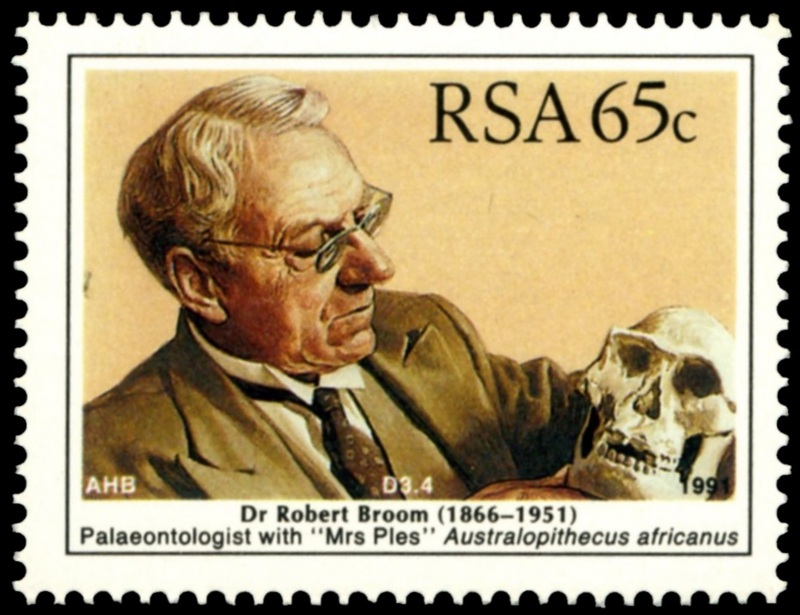 A hundred years after his birth the Robert Broom (Museum was opened at Sterkfontein. Additional exhibits relating to Dr Broom's work are on display at the Transvaal Museum in Pretoria. numerous honorary doctorates and awards were conferred upon him. 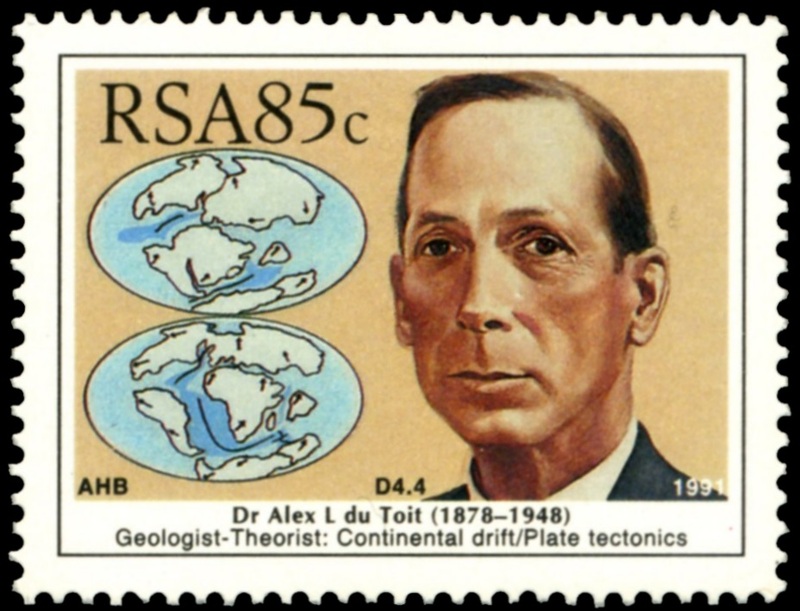 He is widely srecognized as an outstanding field geologist..